Hardik Pandya lived up to his reputation as he delivered with both bat and ball to help Mumbai Indians (MI) beat Chennai Super Kings (CSK) by 37 runs at the Wankhede Stadium. Set a target of 171 runs, Super Kings were restricted to 133 for eight in 20 overs. Pandya after scoring valuable 25 off just eight balls, picked three wickets as well. The defeat was CSK’s first this season as they drop to second place on the IPL 2019 points table. Meanwhile, Mumbai Indians becomes first team to register 100 wins in IPL. CSK stands second on the list with 93 victories. IPL 2019 Points Table Updated: CSK Drops to Number Two Following Defeat Against MI, KXIP Move to Top of Indian Premier League 12 Team Standings. Put to bat first, Mumbai Indians struggled throughout the major part of their innings. However, Kieron Pollard and Pandya’s onslaught helped them post 170 runs on the board. The duo milked Dwayne Bravo for 29 runs in the last over to lift their team to a fighting total. Apart from them Suryakumar Yadav and Krunal Pandya chipped in with valuable 59 and 42 runs respectively. In response, Super Kings were pushed on the back foot early on after Jason Behrendorff and Lasith Malinga struck in tandem. Behrendorff playing his first match has Ambati Rayudu caught behind in the first over. In next over, Malinga accounted for Shane Watson. MS Dhoni Gets Rousing Welcome at Wankhede Stadium As He Comes Out to Bat During MI vs CSK IPL 2019 Match, Watch Video. In the fifth over of CSK’s chase, Behrendorff dismissed Suresh Raina after Kieron Pollard too a stunning catch at sweeper cover. MS Dhoni and Kedar Jadhav then tried to rebuild CSK’s chase and added 54 runs for the fourth wicket. # This was Mumbai Indians' 100th win in IPL (including Super Over wins), first team to achieve the feat. # Lasith Malinga now has the most wickets against CSK in IPL- 26. # MS Dhoni now becomes the second batsman to score 4,000 runs for CSK after Suresh Raina. # Dwayne Bravo becomes the first bowler to take 100 wickets for CSK in IPL. However, Pandya struck twice in the 15th over to remove Dhoni and Ravindra Jadeja. The twin strikes left CSK tottering at 89 for five and the defending champions never recovered from the jolts and slumped to 37-run defeat. 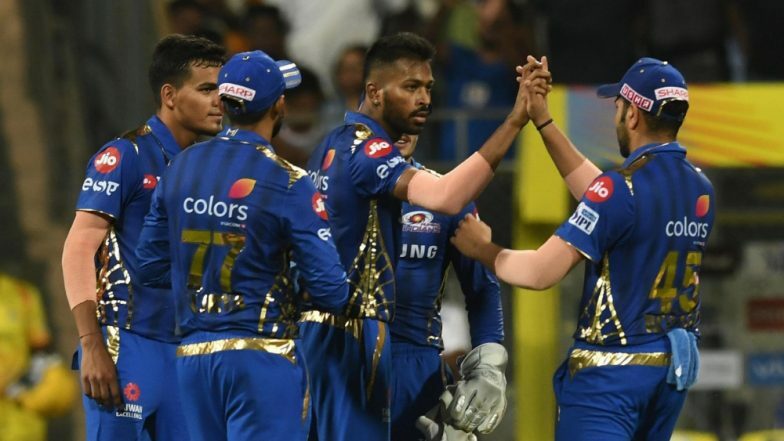 MI vs CSK Highlights IPL 2019: Mumbai Indians Beat Chennai Super Kings by 37 Runs. The win was Mumbai Indians’ second win of the season and first at home. CSK next takes on Kings XI Punjab (KXIP) at home on April 06 while Mumbai Indians travel to Hyderabad to face Sunrisers Hyderabad (SRH) on the same day.